Now, of course, this comes with numerous disclaimers. There are probably things here that you can find in other IDEs, but in the switch from Komodo over to PhpStorm these are the things that I find that I'm liking. First of all, projects are scanned really quickly in comparison. It seems like when I spin up a new project, I'm able to perform auto-completion based on existing classes and functions really fast and able to jump to definitions of functions and variables almost right away. There's some really good search options. So, you can search for file name across the entire project. You can do a general search which will search for file name or even class name or object, and it will sort according to the likelihood that the match is relevant to you. So, it will sort by files that you've opened up recently, for example, and it also has a good and fast search across all of the files in a project similar to what you do with grep on the command line but there's a lot of visualization that can help you narrow down what you want as well as a sub-search so you can search elements that you've already searched for. 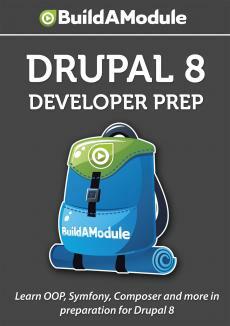 Now, if you've worked with Drupal 7 and Drupal 6 but you haven't really done any object oriented programming, then this might not mean a lot to you, but as you start to work with Drupal 8 it will. There's really good tracing options for inheritance. So, when you're trying to figure out what methods are available for a particular class, for example, based on classes that it inherits from or if you want to know if a particular method is an override of existing methods inside of parent classes, there's inline icons in PhpStorm that tell you exactly when that's happening. And, as I just mentioned, the search is really valuable. You can search across a project or in a particular folder, and there's tons of search options. You can expand the options to see all of the matches. When you click on a match, you can see a preview of that match in a file without actually having to open the file. You'll see me use it a lot in the next videos. As I mentioned before, you can search within search results which is crazy useful, and you can organize search results according to file, according to directory, and several other options. Throughout this series I've been using a program called Kaleidoscope to do our file comparison.